Review This is my least favorite VB game. I hate it. You're entitled to your own opinion. Red Alarm is a line-based 3-D shooter. Let's start with the graphics. What the hell was Nintendo thinking? Line-based???? This game is so damn confusing. You see lines flying everywhere. Empty lines. If you have a solid object, all you see are lines. This makes one confusing experience. Just look at the pics below. I just get lost. One positive thing about R.A. is it actually uses 3-D to further enhance (or screw it up even more) gameplay. The first title to REALLY use it. Music and Sound are also pretty good. The music is actually pretty good, and the sound effects are typical of a shooter. The gameplay of Red Alarm is (as previously mentioned) is one weird experience. The game is both innovative and disturbing. It's an innovative VB title because of its ability for the gamer to explore the worlds, and can also change camera angles. It's disturbing because of there is a total lack of order. The screen (in my opinion) is too busy. That wraps up my review of Red Alarm. I imagine some people will disagree with me. I'll let you write your own review if you want. Whip something up, try to use my new rating system, and mail me the review. 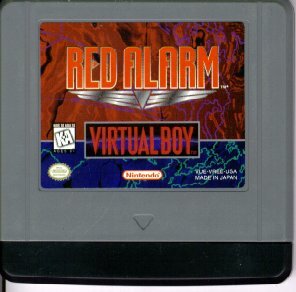 In the end, I think Red Alarm is only worth the $10 I paid for it, and is a dismal StarFox wannabe.